Raymond "Gene" Bielz, age 81, of Marlboro, Ohio, passed away at 2:02 a.m., Thursday, March 29, 2018, at Roselawn Gardens, due to complications from dementia. He was born December 21, 1936, in Canton, Ohio, to George and Susanna (Deppner) Bielz. Gene attended Marlboro High School. He held a variety of jobs over his lifetime including farming, which was his true passion. He retired from MAC Trailer in 2010. Survivors include his wife, Arlene (Oyster) Bielz, whom he married September 14, 1957 at Union Avenue United Methodist Church; children, Tim (Shirley) Bielz of Minerva, Susan (Lonnie) Butner of Alliance, Brian (Kathy) Bielz of Navarre and Cathy (Mike) Ragland of North Canton; grandchildren, Linsay (Brian) Mohler, Jenna (Jack) Kiko, Aaron (Mallory) Bielz, Briana (fiancé, Travis Bowe) Bielz, Celisse (Jason) Borich, and Amanda, Jeremy and Megan Ragland; step-grandchildren, Gina (Curt) Hamilton, Steve Walker, Kim (Dave) Sippola, Katie (David) Price and Kristin Jones; and eleven great-grandchildren. In addition to his parents, he was preceded in death by a sister, Susanna Margaret Burnell; and two brothers, George and Karl Bielz. Services will be held at 11 a.m. Tuesday, April 3, 2018, at Cassaday-Turkle-Christian Funeral Home. 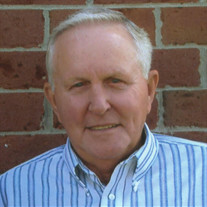 Friends may call from 6 to 8 p.m. Monday, April 2, at the funeral home. Memorial contributions may be made to the Alzheimer's Association 3695 Boardman-Canfield Road, Canfield, OH 44406 or to Community Hospice of New Philadelphia 716 Commercial Ave. SW, New Philadelphia, OH 44663. Gene's family would like to thank the staff at both the Roselawn Gardens and Community Hospice for their compassionate care during his illness. Arrangements are by Cassaday-Turkle-Christian Funeral Home, 75 S. Union Ave., Alliance, Ohio 44601.